Wash the rabbit pieces and set aside. In a bowl, place the flour, add some salt and pepper, mixing them in the flour. Coat the rabbit pieces with the flour and set aside. 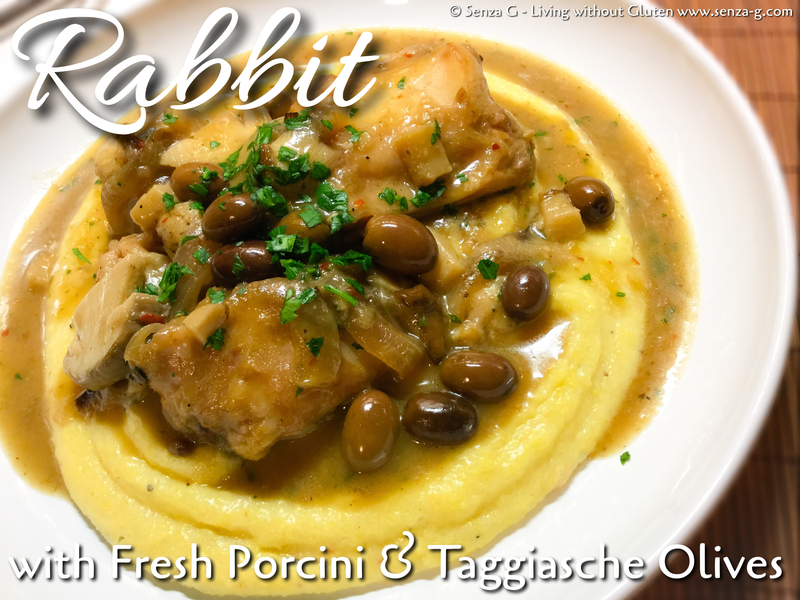 In a large pan, heat some olive oil and fry the rabbit pieces until browned. Take them out of the pan and set aside. In the same pan, add a little more olive oil and saute the onions until translucent. Add the garlic and cook for a couple minutes, stirring. Pour in the wine and cook for a few minutes until it thickens. Add the stock and put the rabbit pieces inside the pan again. Add the sage, bay leaves and juniper berries. Bring to a boil and then lower the heat to a simmer. Cook until the rabbit becomes tender. Add the fresh Porcini and cook for another five to ten minutes on low heat. Season with salt and pepper and throw in the olives. Keep cooking for a few more minutes. If you see that the sauce is too thick add a dash of stock. Remove the sage and bay leaves. Sprinkle in the freshly chopped parsley. Serve either with mashed potatoes or creamy Gorgonzola Polenta.